Earn $21.40 in Rewards credit (2140 points) What's This? 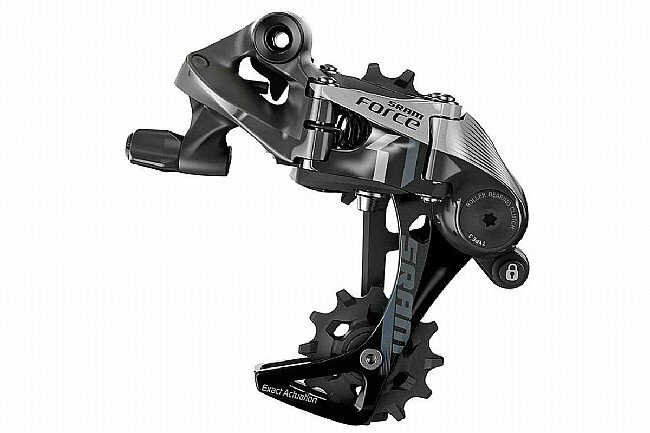 The SRAM Force 1 Type 3.0 Rear Derailleur brings an ingenious Cage Lock system and a smoother torque curve for quieter and more consistent operation. The iconic 1x rear derailleur provides smooth, reliable shifting through the entire gear range, while keeping the chain firmly planted on the cassette for precise power transfer. 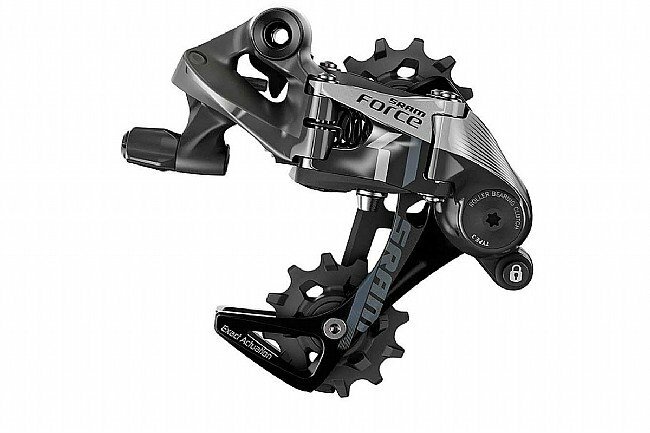 With the Force 1 Type 3.0's Roller Bearing Clutch, SRAM has all-but eliminated pesky chain slap in 1x drivetrains. Utilizing Exact Actuation technology, the Force 1 uses the same amount of cable pull through the entire shifting range for precise shifting that requires the same response through the entire range. And if or when the time comes for a quick wheel or tire swap, the inclusion of their new Cage Lock system means the derailleur can get locked in an out-of-the-way position with the simple push of a button. 1x-specific rear derailleur ideally suited to cyclocross, gravel or road riding. Compatible with 10- or 11-speed Exact Actuation shifters. Roller Bearing Clutch keeps the chain planted on the cassette, eliminating chain slap. Cage Lock system locks derailleur out of the way for quick and easy wheel or tire changes. This derailleur survived when all else failed at the 2014 Washington County Fairgrounds Cross Crusade race. There were 107 DNFs, most due to rear derailleur failures. Not only did the CX1 work throughout the race, it shifted brilliantly under load even when it was completely packed with mud. 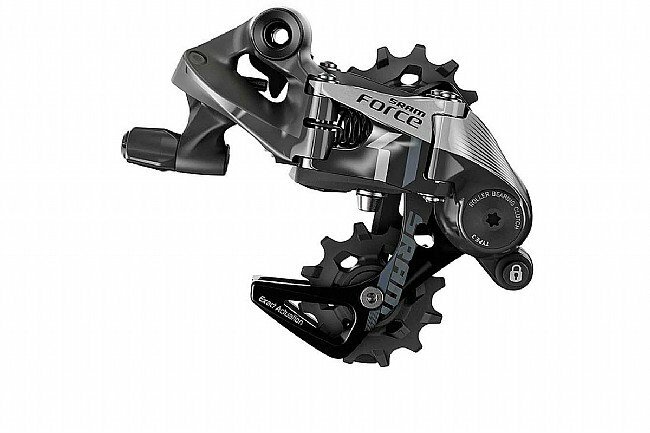 I used this derailleur with a 12-30 Shimano Ultegra Cassette, a Shimano 105 10-speed chain, and a Race Face Narrow Wide 40T chainring up front. I purchased this CX1 rear derailleur to work in conjunction with my 10-speed SRAM Force shifter on a 1x10 system for my Asylum Meuse. Let me say that this is probably the coolest piece of bike tech I've purchased in two years. Not only is it super durable, it's snappy and responsive and when combined with a narrow wide chain ring, I've experienced absolutely NO chain dropping or chain slap on my stays. This is in large part thanks to the clutch system. I'm also very impressed with how aggressive the teeth on the pulleys are (they really hold onto the chain and make sure it keeps moving even when it's all gunked up). If you have SRAM shifters and you're looking for a way to lighten your bike, upgrade your shifting, and switch to a 1x1011 system, this is the best thing you can get. What's more, when and if I decide to upgrade to 11-speed, all I have to do is get a new right shifter. Adjusted it using the videos then a second minor adjustment after the first ride and since then has worked as smooth as silk even shifting under heavy load. CX1 is a perfect system. No dropped chain, foolproof setup. 40T front, 11-32 back gives me everything I need to CX racing and some trail rides.